All players will be called by your coach with your first game site and time after the coaches meeting. Shin guards are required. Soccer cleats are not required but preferred. Each player will receive a team T-shirt to keep. Coaches Needed: 2-3 per team, if you sign up to coach and pass a background check please plan on attending the coaches meeting. Registration deadline is Wednesday, February 6 / Late Fee: $10 after February 6 if space is available. Sorry, we cannot off er a refund after the coaches meeting has been held. The registration form is on page 47 or register online. Boys and girls must play in their age appropriate group and may not “play-up” into Pre-K or Kindergarten soccer. A 2nd Grader may play up in to the 3rd/4th grade league if a parent coaches. Ages 3.5 & 4 *Must have turned 3 by August 31, 2018. Kindergarten class of Fall 2020-2021. Photo Day/First Game: Saturday, April 6 at Waconia Middle School Cafeteria A coach will email with time after the coaches meeting has been held. Days of Play: Monday and Saturday OR Tuesday and Saturday. Times: During the week, times vary between 5:30pm-8:00pm / Saturday morning or afternoon. Length of Season: May play until May 28 depending on weather cancellations. CE will reschedule at least 2 make-ups due to weather cancellations. Coaches Meeting: Monday, March 18 from 6:30pm - 8:00pm in the Bayview Gym. Ages: For boys and girls currently in Kindergarten the 2018-2019 school year. Photo Day/First Game: Saturday, April 6 at Waconia Middle School Cafeteria. A coach will email you with time after the coaches meeting has been held. Length of Season: May play until May 20 depending on weather cancellations. CE will reschedule at least 2 makeups due to weather cancellations. Days of Play: Tuesday and Saturday OR Thursday and Saturday. Dates: April 6, 9 or 11, 13, 16 or 18, 23 or 25, 27, 30 or May 2, 4, 7 or 9 & 11. Time: During the week times vary between 5:30pm-8:00pm \ Saturday morning or afternoon. Length of Season: May play until May 23 depending on weather cancellations. CE will reschedule at least 2 make-ups due to weather cancellations. Roster Size: 7-9 players per team (pending registration numbers). Photo Day/First Game: Saturday, April 6 at Waconia Middle School Cafeteria. A coach will email with time after the coaches meeting has been held. Length of Season: May play until May 25 depending on weather cancellations. CE will reschedule at least 2 make-ups due to weather cancellations. Coaches Meeting: Monday, March 18 , 6:30pm- 8:00pm Bayview Gym. Meet Coach and Team/Photo Day: Thursday, April 4th in the Waconia Middle School Cafeteria A coach will email with time after coaches meeting has been held. Dates: April 6, 8, 13, 15, 27, 29, May 4, 6, 11 & 13. 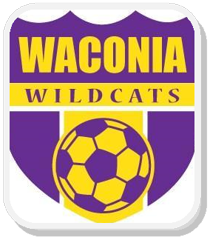 Sites: Waconia or St. Boni Locations *This league could conflict with Waconia MYSA Soccer and Waconia Metro Baseball scheduling. Dates: April 6, 11, 13, 18, 25, 27, May 2, 4, 9, 11 & 16. Sites: Waconia or St. Boni Locations *This league could conflict with Waconia MYSA Soccer and Waconia Big West softball scheduling. This league will focus on competition with local communities: Glencoe, Hutchinson, NYA, Sibley East, McLeod West and Lester Prairie. This is a grade level league - no age restrictions. Local League Soccer is not affi liated with MYSA. Players may also participate in the MYSA U-12 league, however, you would be responsible for both participation fees. Coaches Needed: 2-3 per team, if you sign up to coach and pass a background check please plan on attending the coaches meeting and player review. Note, players may be able to play both baseball/softball and this local Soccer League if they choose, but there IS overlap of the leagues. Registration deadline is Wednesday, February 6 / Late Fee: $10 after February 6. Sorry, we cannot off er a refund after the coaches meeting has been held. A 4th grader may play up in to this league if a parent coaches. The registration form is on page 47 or register online. A 4th grader may play up in to this league if a parent coaches. Ages: Grades 5 & 6 Girls (2018-2019 school year.) Open to girls only. Practice Times: Will be scheduled by coach based on team availability. Will be Monday, Tuesday or Thursday nights 1-2 nights per week. Number of Games: 6 game dates which will include 6-7 games. Game Dates will be 6 of the following dates: April 6, 13, 27, May 4, 11 & 18 - TBD *Rain out rescheduled games could be scheduled during the week. *This league could conflict with Waconia MYSA Soccer and Big West softball scheduling. Player Review & Coaches Meeting: Tuesday, March 12th at Laketown Elementary School Gym Player review is from 5:30pm-6:30pm. Ages: Grades 5 & 6 Boys (2018-2019 school year.) Open to boys only. Player Review & Coaches Meeting: Tuesday, March 12th at Laketown Elementary School Gym Player review is from 6:30pm-7:30pm.